The Riviera Maya, which is also sometimes referred to as the Mayan Riviera, stretches over nearly 100 miles of coastline with beautiful white-sand beaches and brilliant turquoise colored water just south of Cancun. This world-renowned paradise is home to mangroves and lagoons, ancient Mayan cities, ecological reserves and adventure parks, and the world's second largest coral reef. The Riviera Maya runs along the Caribbean coastline of the state of Quintana Roo. It begins 20 miles south of Cancun in the town of Puerto Morelos and extends down to Punta Allen, a fishing village within the Sian Ka'an Biosphere Reserve. South of the Riviera Maya, you'll find the Costa Maya, an even more secluded and pristine area. Don't confuse the Mayan Riviera with the Mexican Riviera, which is the name given to Mexico's Pacific coastline. This area was an important commercial and religious center for the ancient Maya, and there are many archaeological sites to discover in the area, such as Tulum, Cobá and Muyil. For hundreds of years, the area remained isolated from the rest of the country due to the lack of adequate roads. As Cancun was developed, some tourists wanted an alternative to the mega-resort area, and the Riviera Maya was discovered. Although there are large hotels and tourist amenities throughout the area, there are many eco-tourism options that allow visitors to experience the natural resources and amazing biodiversity of this beautiful region of Mexico. Playa del Carmen was a sleepy fishing-village but has grown into a cosmopolitan town, the largest in the Riviera Maya, but still small enough to get around on foot. If you're interested in shopping, nightlife and fine dining, this is the place, but the beach is also alluring. Playacar is a nearby resort area offering upscale accommodations and some all-inclusive options. Cozumel, the largest island in the Mexican Caribbean, is a short ferry-ride from Playa del Carmen. It's a great spot for scuba diving and snorkeling, the clear water offering visibility of up to 200 feet. The center of the island is mostly undeveloped jungle and lagoons with many endemic species of small animals and birds. Chankanaab National Park has a botanical garden featuring tropical plants, and Chankanaab Lagoon, a natural aquarium with more than 60 species of tropical fish, crustaceans and corals. 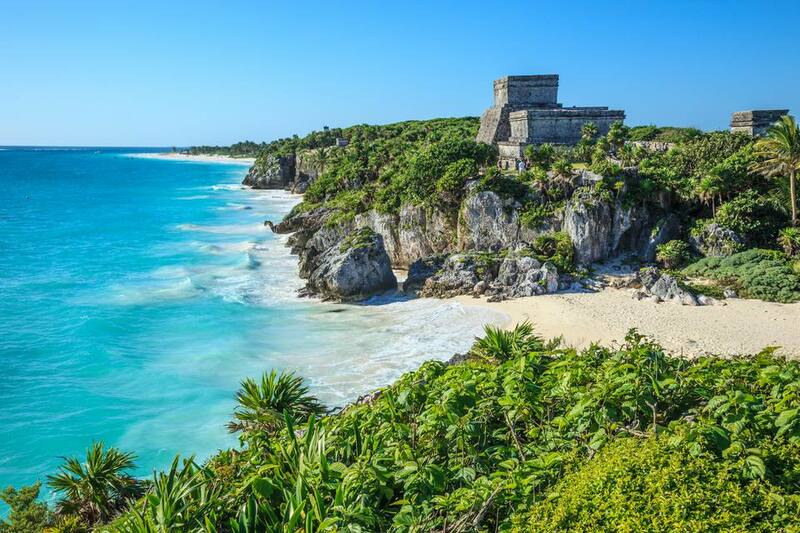 Tulum was once a busy Mayan ceremonial center and trading port. The ruins are in a spectacular setting, on a cliff overlooking the Caribbean Sea. The town of Tulum has budget options for accommodation as well as some nice cabanas to rent along the beach. One interesting option is the Nueva Vida de Ramiro eco-resort. The unique topography of the Mayan Riviera makes it an ideal destination for adventure seekers. You can dive in cenotes, swim or raft in underground rivers, ride ATVs through the jungle and fly on ziplines. Xcaret Eco Theme Park offers an abundance of activities for all ages. A full day can be spent in Xcaret swimming in underground rivers, snorkeling, seeing a re-enactment of the pre-Hispanic ball game, visiting ancient Mayan ruins and topping off the day by watching the spectacular cultural show that is presented every evening. In Xel-Ha Park subterranean currents of fresh water combine with salt water producing a unique ecosystem with multitudes of tropical fish perfect for snorkeling. Other activities at this water theme park include floating along the river on inner tubes, swinging over cenotes and swimming with dolphins. If you get tired of being in the water you can go on an ecological walking tour through the surrounding jungle, or take a break on "Hammock Island." Aktun Chen covers almost 1000 acres of rainforest and is home to 3 caves with underground rivers. An easy walking tour of the main cave lasts about an hour and allows visitors to witness spectacular geological formations. Walking through the park's jungle paths offers the chance to glimpse some of the area's wildlife. Xaman Ha Aviary is an open-air sanctuary in Playacar providing a natural habitat to over 60 species of tropical birds. Meander the sanctuary's paths and trails and see if you can spot toucans, macaws, flamingos, egrets, herons and other beautiful birds of the area. Sian Ka’an Biosphere Reserve is one of the largest protected areas in Mexico and has 2500 square miles of unspoiled natural beauty with unexcavated Mayan ruins, fresh water canals, mangroves, lagoons and inlets. Visitors can learn about its diverse wildlife and participate in conservation projects. Ecological tours of the reserve are offered, as well as kayak tours and fly fishing. Note: In the ecological parks of the Mayan Riviera the use of regular sunscreens is prohibited for swimming and other water activities because oils can be damaging to the water-life ecology. Special eco-friendly sunblocks are allowed and available for purchase throughout the area.